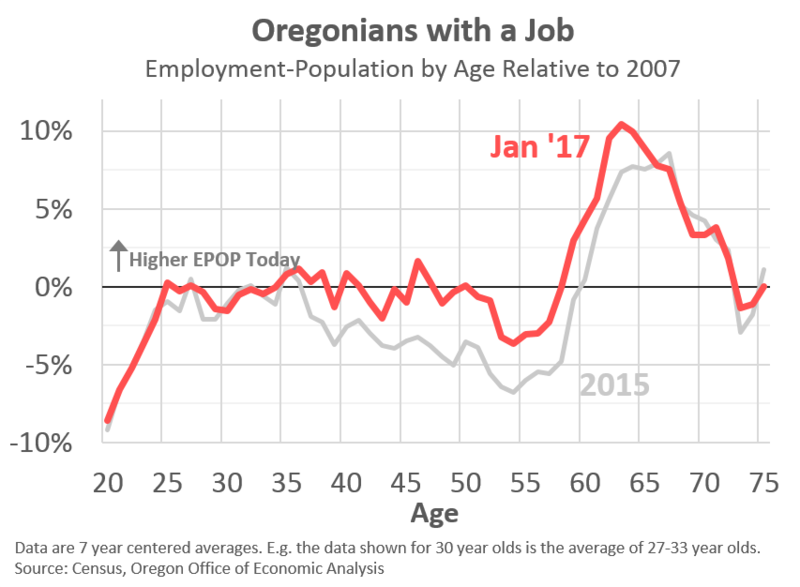 As I mentioned the other day, the share of the working-age population here in Oregon with a job has returned to where it was prior to the Great Recession. This is good news, particularly since the last time we took a look at employment rates by age there were a few missing pieces. 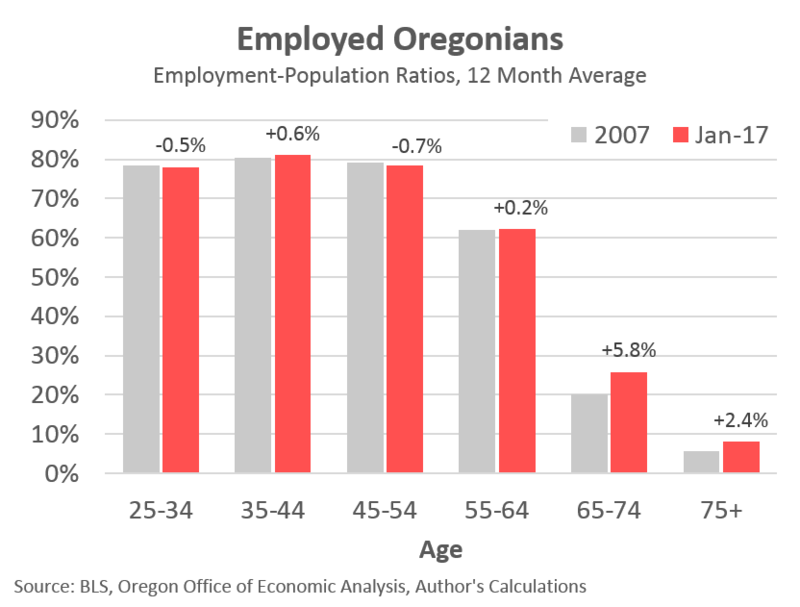 Specifically, what we saw were lower employment rates for Oregonians in their 40s and 50s. The concern was the impact of long-term unemployment, job polarization, and age discrimination in the hiring process may leave a permanent gap in employment opportunities. As I was updating some of this data recently I noticed that this gap no longer existed. 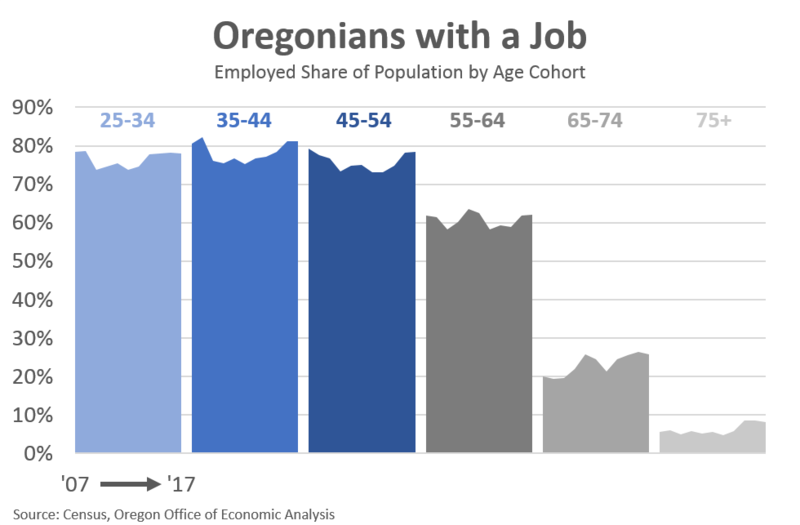 The share of middle-aged Oregonians with a job has picked up. This is highly encouraging. You can really see the difference between the gray and red lines in the chart below. This next chart shows the same data, but in a different way. This is probably a bit more intuitive to see 2007 and 2017 employment rates standing side-by-side. Note that the data is noisy and based on relatively small sample sizes, so differences of half a percent are negligible to the story the data is telling. For those wanting to see how these employment rates have changed over the entire business cycle, this third graph is for you. The tight labor market is likely driving these results. Not only does a tight market mean businesses must compete more on price (wages) to attract and retain the best workers, businesses must also cast a wider net when looking for potential employees. Firms may need to take a bigger risk in hiring someone without the perfect resume, or has an incomplete skill set. On the job training becomes more important in a strong, but tight, labor market. The combination of more employment opportunities and rising wages is also pulling workers back into the labor market. Participation rates are rising and the number of individuals who report they aren’t even looking for work one month but have a job the next month is higher today as well. The tight labor market which drives these processes is expected to continue moving forward, at least until the next recession. Finally, just because we are back to 2007 employment rates, it does not mean the economy is necessarily all the way healed. 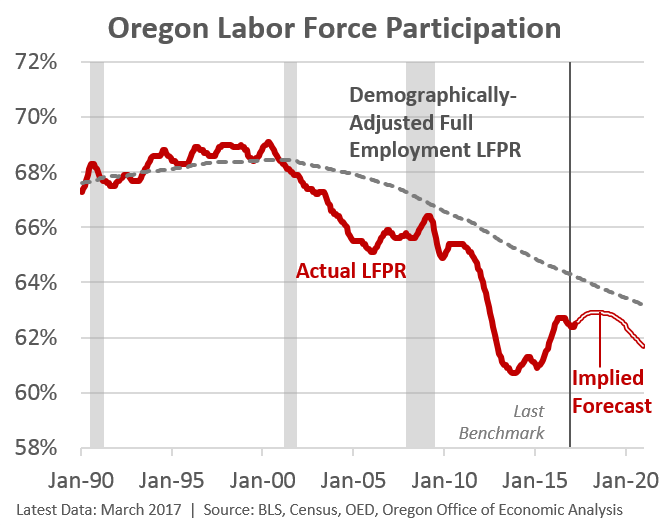 There is still likely room for further improvements, such as reaching employment and participation rates seen in the late 1990s. Here the concern is that the gap between today and the late 1990s may be permanent. The damage done by an underperforming economy for much of the past 17 years may be too much to overcome. As our office’s outlook shows, we do think some of this gap is structural, and/or permanent. Really the only way for us to know for sure is if the expansion and the tight labor market continues for another couple of years, at least.